First of all, I love your pronunciation of the story's title Indeed, near the Black Forest lies the Upper Rhine Plain which has the hottest summers and mildest winters in all of Germany. Now to the story itself: it had some dark fairy tale setting, but I was missing some more conflict, even the priest was accepting the role of wizards after the explanation. I had expected some more dramatic events like a burning of the wizard. I liked the similarities between computer programming and writing the magic 'software' for the daemons in Zauberschrift. I liked the similarities between computer programming and writing the magic 'software' for the daemons in Zauberschrift. 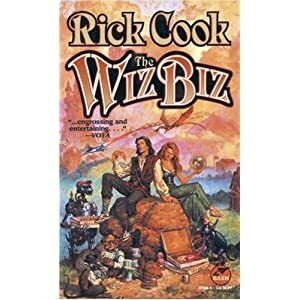 Indeed, its a very fun mix and basically the plot of "The Wiz", the story of geek stolen away to a magic realm to defeat evil wizards (its okay to groan). Nevertheless a fun romp where he literally invents a programming language for magic spells that are essentially so unique the evil wizards can't quite grasp how to stop it! In other news, I quite enjoyed this story, I've always liked the idea of passive forms of magic like where it is written and then magic follows along. A wizard chanting and waving about a wand certainly fits but runes or writing a spell just clicks for me, I suspect its because I like writing and if you do it well that is a lot like magic! As a maintenance programmer, I sympathized with the former apprentice wizard stuck with debugging another wizard's work, particularly when that other programmer... err... wizard was supposedly more experienced and should've known better. In typical programmer fashion, he first blames the hardware (i.e. the moldy book) before realizing that it was, in fact, more of a software problem. In typical programmer fashion, he first blames the hardware (i.e. the moldy book) before realizing that it was, in fact, more of a software problem. Yeah, I liked this one too. I kept wondering if Ulrich and Agnes were going to "hook up" though. I guess that's weird, because she must be much older than him, but stranger things have happened. Anyway, there were a lot of plots that could have been developed more, and may still be for all I know, but I find that when a story leaves you wanting to know more about that world, it's not usually a bad thing. The moral to this story: When you ask someone to help you with arcane matters, let them work it out, don't interrupt. I got into fantasy via Tolkien and Lewis, in whose worlds the mechanism of magic is almost a misnomer: Gandalf and Narnia simply are magic and you don't worry about the "hows" or "whys" much less the limitations. However, one thing that I'm appreciating more and more is when a fantasy story has well thought out and consistent rules for its magic. This story took that to an awesome extreme and I loved every moment of it. Plus, a wizard who is just as worried about his textiles as he is about the daemons controlling the weather is a really amusing combination of the fantastic with the mundane. This one didn't do much for me, alas. The conflict and resolution both felt pretty contrived, and nothing really brought me into the characters' mindset. There was a pretty obvious villain from the first mention of Heinrich, and the chase through the woods seemed more like an Idiot Ball moment than a comprehensible decision by the villagers. Then, the resolution is basically, "And then he actually bothered to look at what he was doing and realized that the problem was blatant and easily repaired." It would be like if Star Wars ended with the Rebel Alliance checking the Galactic Internet and noticing that the Galactic Anonymous had leaked another copy of the Death Star plans a couple of weeks earlier. I dunno. It felt pretty unsatisfying, and I found my attention wandering off several times. The magic system was pretty nice, though, and I admit I also thought immediately of the Wiz series. I also wanted to post to say I love it when authors come up with clever systems of magic, and explanations for how it works behind the scenes. It's a fun spin on the magic trope, and I think it can be a lot of fun for characters to explore and for readers to follow along. The works I think of in this vein are The Dragon and the George by Gordon Dickson, and the Dragons series by Patricia Wrede (all excellent books btw). And I have to also mention that Wilson Fowlie nailed the narration on this one. He always does a great job with fairy-tale-esque stories! As a systems admin, I can also appreciate the parallel between software/ hardware problems and I have to admit that it made me smile--especially a few incidents where the problem was a tiny typo, but caused a system crash on a grand scale. I must admit that I also enjoyed the daemons/demons explanation. It made me chuckle as I remembered telling a colleague I would gather my host of daemons and smash his 'windows'. The story was great and I doff my hat to Wilson for making this such an enjoyable listening experience. At first, when Agnes appealed to Ulrich via Becca, I said to myself 'bleh, here comes another love story where past regrets can be mended.' Finding out that Becca is not only dead, but had been married with a husband and a couple of kids was a great turn for the story. It's always a strange feeling to "come home" when you've been gone and see the huge changes that have been wrought in your absence and this story really brought that home for me. Maybe it's just a series of odd events taking place in my own life, but in the end I found this story was quite a playful romp and I thought it was absolutely wonderful. I was intrigued when childoftyranny mentioned that and now my interest has been piqued again ... but my local library doesn't carry these. I offer magic words to betterworldbooks, for a copy of the mentioned series, it may prove worth your while since they are pleasently cheap and if you are in the US or Canada, I of course forgot to see if it noted where in your post, the shipping is free. I definitely liked this one quite a bit, and I thought there was good conflict and resolution in this story, but maybe not the one people were looking at primarily. I saw the conflict as "how to get the daemons to behave", and the resolution of "pay attention to the magic and what was really going on in the book rather than rote repetition" to both be satisfactory to my mind. I am a problem solver at heart, it is what I do best, and to see the MC puzzling over the problem then using problem solving techniques to resolve it scratched that itch for me. My only complaint was the very end, where the villagers ask him to stay, it just seemed tacked on. I would have ended it with the villagers turning their faces up to the sun. Ditto. And ditto explaining part of the dynamics behind this scenario's magic system. Also, David Levine might be interested to discover that there is an ancestral myth among the Melanesian peoples of the East coast of Kanaky (the island of New Caledonia, in the South West Pacific), in which a local sorcerer tempts some villagers into building a huge magical canoe, thereby also provoking a devastating rain -interpreted as the ancestral nature spirits getting back at humans and the sorcerer's overreach - which then lasts for almost an eternity. So long, in fact, that the sorcerer dies while the rain goes on and on; this is why several myths among these peoples take place during a continuous rainfall. Like most myths, this one has multiple tellings, and there is no one specific ending for it, but eventually it requires another sorcerer coming in and mopping up after his predecessor's snafu. Honest...I realise this is a totally nerdish factoid, but it was the first thing I thought of while listening to this story. I've got to say I'm with Scattercat on this one; the story didn't do it for me. I would have found the magic setup quite interesting if it had been a more central focus of the plot -- if the story had been more about Ulrich's "debugging" of code he barely understands in the first place. Instead he cleaned everything up without really looking at it, then solved his problem in the end by finally paying attention to the words (and risking himself with the seal, which seemed unrelated enough to the rest of the magic that I didn't get much impact from the moment), and in the meanwhile the story spent lots of time on the villagers coming after him with pitchforks. That stuff didn't hook me nearly as much, so my attention wandered far too often. I'm slightly 'meh' as well. The system of magic is brilliant, and I really dug that, especially the diagnostic skills the MC has to call on (like others who appreciate this aspect, I do something similar in my day job). But the sense of tension fell down there at the end. There were a couple of brief mentions that the sealing of a spell was dangerous - it even risked the wizard's death if he'd done it wrong - and then it was just a couple of drops, which kind of undercut the whole thing; Heinrich's idiocy is something that he uncovers in a quick read while hiding from angry villagers, and therefore seems like something he should have caught the first time when he had two weeks and good light and space to work in. To play devil's advocate to my own argument for a bit, it's true that when you're just doing a humdrum task you might miss something that seems obvious when you look specifically for it. One might not notice a particularly damning clause in one's User Agreement when preparing to click "yes", but scanning the paragraphs looking for "first-born child" would turn up a surprising result. One might not notice a particularly damning clause in one's User Agreement when preparing to click "yes", but scanning the paragraphs looking for "first-born child" would turn up a surprising result. Once again, keenly feeling the lack of a 'Like' or '+1' button in the forum software.